How do the FR2 and 3CS2 units work? Let us show you how. Water flows by natural convection from the above holding vessel directly into tubes, and a heating element wrapped around the outside. 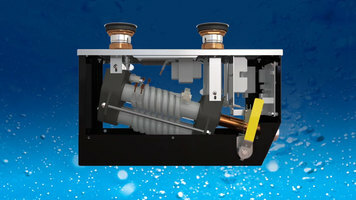 This unique tubular design eliminates issues with hard water and scale, as heating elements are never immersed directly into the water. These heating elements heat the water and the heated water naturally flows upward and returns to the holding vessel. An electronic controller accurately maintains the set point temperature based on your application. Hatco's FR2's are designed to be used with a bain marie or a food rethermalizer. Either holds foods at temperatures between 140 and 190 degrees Fahrenheit, 60-88 degrees Celsius. The desired holding temperature is maintained by an adjustable thermostat. Note that a fabricated water baffle is required when a hydro heater is used in support of a bain marie, in order to prevent the water from directly recirculating back into the unit to maintain even temperatures throughout the water vessel. Designed to fit under the center of sink, Hatco 3CS2 is perfect for three or four compartment sinks, pots and pan sinks, and bar sinks. Electronic controls keep the temperature at 180-190 degrees Fahrenheit, meeting NSF's regulations. That's 82-88 degrees Celsius. The benefits of Hatco 3CS2 and FR2 hydro heaters include accurate and reliable temperature control, reduced labor and training, improved food safety, reduced energy, product quality, longer holding times, and reduced cooking equipment expense, space, and cleaning. The result of a hydro heater's unique heating technology is consistent and reliable with accurately heated water, when and where you need it, every time you want it. And don't forget about the knock-your-socks-off customer service that makes Hatco famous. 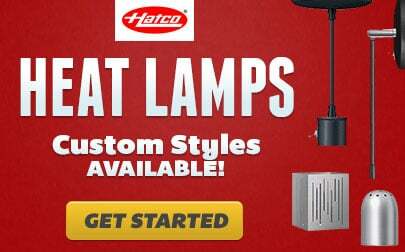 Call your local Hatco dealer, sales representative, Hatco customer service, or visit AutoQuotes. Watch this quick, informative video on how Hatco's FR2 or 3CS2 hydro heaters could be of great benefit to your establishment! How do you clean the Hatco FR2 rethermalizer/bain-marie heater and 3CS2 sanitizing sink heater? Let us show you how! To keep your Hatco unit in top operating condition, you need to clean and sanitize on a routine basis, whenever food particles accumulate in the tank, whenever a food product spill occurs, or whenever the unit is to be stored or shipped. 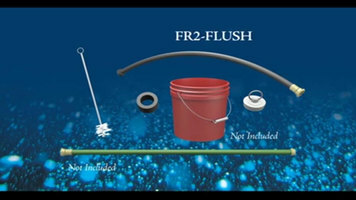 To clean the unit, you will need to order the FR2-FLUSH accessory kit that includes a cleaning brush, flush hose, stopper, and adapter. You may also need to supply a second drain hose and a 2 gallon or larger bucket for draining the rinse water. First, turn the power to the unit off and allow the water in the unit to cool. Attach the threaded hose fitting to the brass threaded outlet port on the lower front of the unit. Place the other end of the hose into the bucket for draining. Turn the yellow side drain handle all the way back to the rear. Water will begin to drain from the unit into the bucket. After the unit is completely drained, remove the right and left port caps and lower the drain hose. Insert the cleaning brush into the left and right ports and scrub back and forth to knock loose any obstructions. Clean the lower drain in the same manner. Place the threaded caps back into the two ports and reattach the lower drain hose. Insert the stopper into one of the sink's two drains. Attach the supply drain hose to the faucet. Insert the hose end with the adapter into the other open sink drain. Turn on the faucet and let water run out of the lower drain hose until the water runs clear. Turn the water faucet off. Switch the hose with the adapter and the stopper so that they are in opposite drains. Turn on the faucet again and let the water run until clear. Turn off the faucet. We have removed obstructions from the unit, and now we're ready to sanitize! Remove the hose with adapter and stopper from inside the sink and close the lower drain. Dissolve a safe, non-toxic, non-corrosive sanitizer into 1 gallon of hot water. Pour into the sink or holding vessel. Allow to soak. The soak time will be determined by the brand of sanitizer used. After letting the solution soak, drain the solution by opening the lower drain. Reinsert the stopper and hose with flush adapter back into the sink drain. Turn on the faucet until the water runs clear. Turn the water faucet off. Switch the hose with the adapter and the stopper so that they are in opposite drains. Turn on the faucet again and let water run until clear. Turn the unit's yellow drain handle forward to the closed position. Disconnect the hoses, empty your bucket, and your Hatco FR-2 or 3CS2 unit is ready again for worry-free operation. You may find that units using water that contain high lime and mineral content may require deliming with a mixture of 75% water and 25% white vinegar. In this case, follow a procedure similar to the sanitizing steps. Don't forget about our knock-your-socks-off customer service that makes Hatco famous! Contact your local Hatco dealer, sales representative, Hatco customer service, or visit www.hatcocorp.com for more information. This step-by-step video will take you through how to clear obstructions from the drain of your FR3 or 3CS2 sink as well as how to sanitize your unit! Check out this video to see just how easy it is. 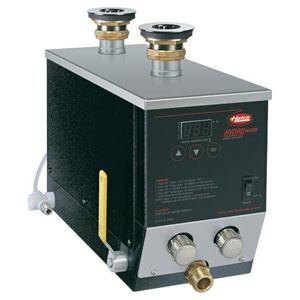 Ensure that rinse water is kept at the proper temperature at all times with this Hatco 3CS2-3 3 kW Hydro-Heater sanitizing potwashing sink heater! Perfect for kitchen warewashing areas with limited space, this sink heater works by drawing water from the sink's bowl into a chamber, where the temperature is boosted to proper sanitizing levels before being flushed back into the sink. This process helps speed up manual warewashing tasks and reduces the amount of chemicals needed, leading to consistently cleaner dishware and glassware. It also features heating elements that are wrapped around the flow chamber, which allows less sediment and lime buildup on the elements and longer overall product life. Left to Right: 7 3/4"